For the third consecutive year, Guerlain has joined the fight for men’s health, supporting the Movember initiative. The Perfumes and Cosmetics house is showing its corporate citizenship with a touch of lighthearted humor. Each November, the Movember movement invites men to grow a moustache to raise awareness and funds for research. Millions of people have joined the movement since its creation in 2003, enabling the Movember Foundation to finance over 1,000 men’s health programs, especially for prostate cancer research. Guerlain employees are once again supporting this cause, joining together in the “Moustache de Messieurs” collective, sponsored by Guerlain perfumer Thierry Wasser. They will let their moustaches grow throughout November to sollicit donations. 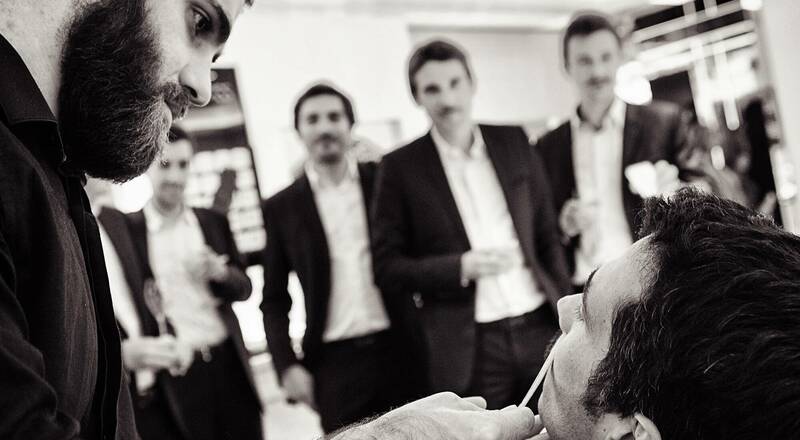 Also this year, Guerlain has invited “La Barbière de Paris” to host traditional shaving workshops in its Paris stores. Customers can get a perfect shave on Saturday, November 14 at the Maison Guerlain at 68, Champs Elysées and the Boulevard Haussmann store, and on Saturday, November 21st at the Sèvres and Franc-Bourgeois (from 2 pm to 7 pm). All proceeds from the shaving services will be donated to Movember France. It’s possible to support Guerlain’s employees by giving a donation directly on their Movember’s page.